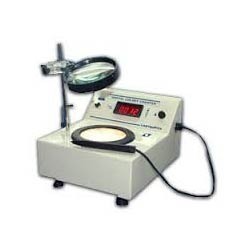 Offering you a complete choice of products which include digital colony counter. Housing of Digital Colony Counter is constructed with heavy gauge mild steel, is finished with powder coated epoxy paint. Counting plate with illuminated standard wolfhugel ruling is fitted with magnifying glass on front slope of Digital Colony Counter. Each touch of marking pencil in the colony count by 1 & the flowing LED Digital depicts the total colony count. Maximum colony count possible in our Digital Colony Counter is up to 9999 (4 digit display).